What’s the Difference Between Drying Lotion, Drying Cream & Buffering Lotion? Congrats! You’ve come to the right place for fast-acting, clear skin solutions. 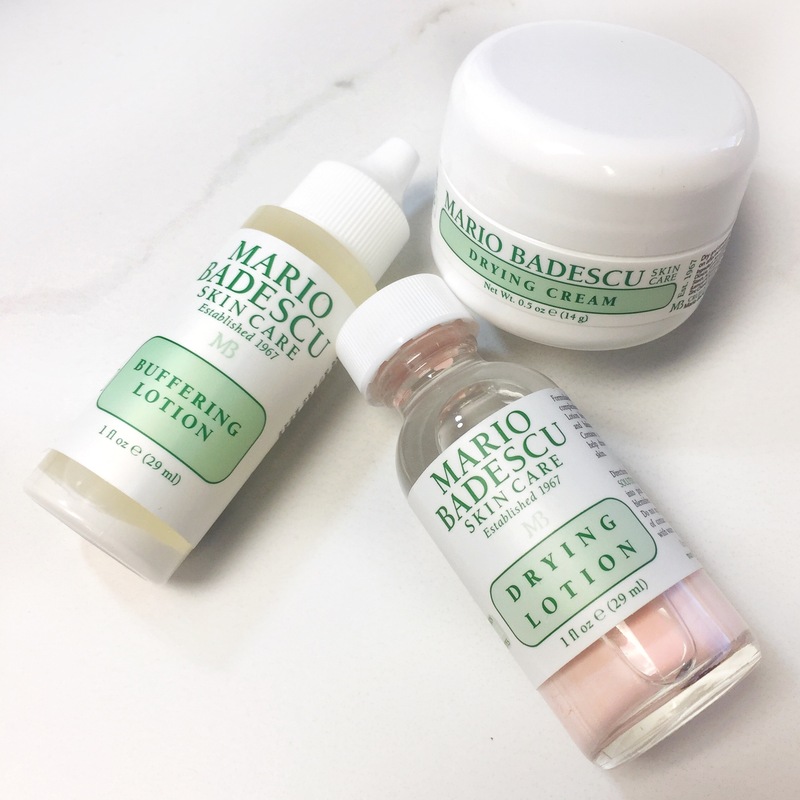 But with not one, but three spot treatments in front of you, which of these Mario Badescu products will work best for your breakouts? Drying Lotion is the original, award-winning product that targets pimples while you sleep. It was formulated by Badescu himself in the 1960s and has since taken top shelf in medicine cabinets around the world. Whatever you do, don’t shake the bottle. It’s tempting—it’s the first thing most people do when they see it—but Drying Lotion is meant to work as a bi-phase solution. Dip a cotton swab into the pink sediment. Here’s a tip: use the smaller, fine-tipped cotton swabs for more precise application. It’ll grab less product too, which means your bottle will last you a little longer. Apply the product directly to whiteheads. Think of Drying Lotion as a tiny pink mask for every pimple. Leave it on overnight and wash everything off come morning. Voila! Small bumps and pimples? Use Drying Cream. Drying Cream is specially formulated to target and dry up those clusters of small bumps and blemishes. After you’ve cleansed and toned your skin, pat a small amount of the cream on those breakouts. The powerful Sulfur and Zinc Oxide formula works to clarify troubled areas so skin appears smoother and clearer the next morning. Large and painful, under-the-skin bumps? Use Buffering Lotion. These are the kind of bumps that hurt to the touch and feel deeply rooted in the skin. Because this type of breakout doesn’t come to a head, they require a little extra care. Enter Buffering Lotion, a unique solution to these blemishes. Unlike most spot treatments, Buffering Lotion isn’t a paste or gel-like product. Instead, it’s super thin and water-y in consistency, which enables it to sink quickly into the skin and target problems at the root—so don’t be alarmed when you first start using it! For starters, do shake the bottle: you want the white sediment to mix with the liquid so it turns milky-white in color. For every spot you see, squeeze one drop onto a clean fingertip and gently pat it onto the blemish. …so what’s the Anti-Acne Serum¸ you ask? Anti-Acne Serum isn’t a spot treatment. It’s a super lightweight gel that’s designed to re-balance skin and promote a clearer complexion. Here’s how: Salicylic Acid (a powerful beta hydroxy acid) helps rid the skin of pore-clogging sebum and dead skin cells—which when left to accumulate, leads to breakouts—and allows Thyme Extract to clarify pores. It’s easy to use too. Apply nightly on breakout and blackhead-prone areas to keep skin looking clear for the long-run.